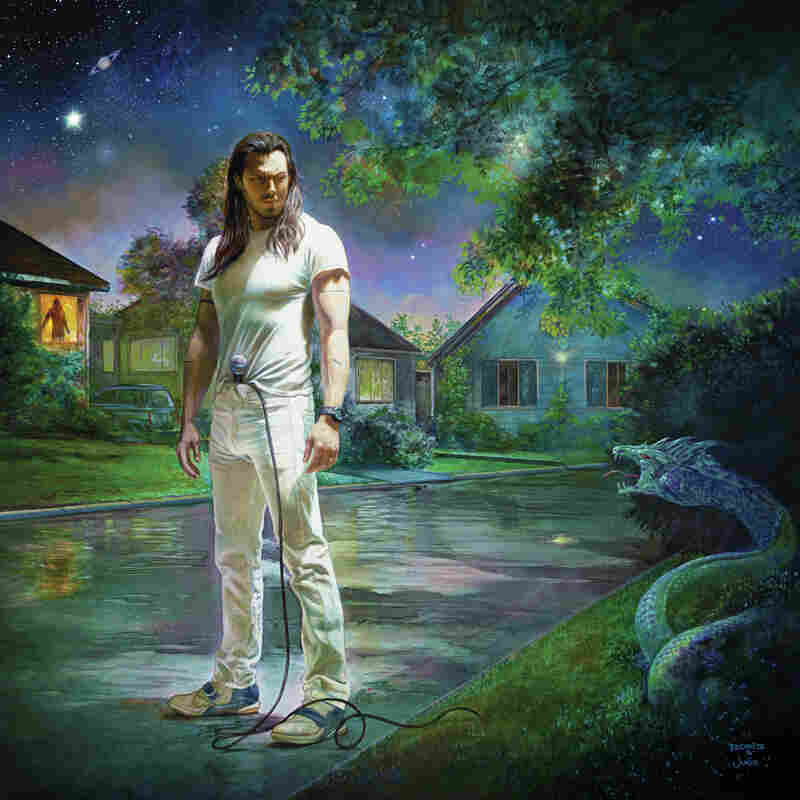 Review: Andrew W.K., 'You're Not Alone' The sprawling, 16-song album is a cornucopia of spirit-lifting, even occasionally reflective party jams. Andrew W.K. has never been known to skimp on anything — except maybe angst. So it's no surprise that his ecstatic new album You're Not Alone, his first in 12 years, is as big as it is bold. A lifelong fan of the fantasy artwork of Boris Vallejo and Julie Bell, W.K. commissioned them to paint the cover of You're Not Alone, which depicts the fist-pumping, party-centric singer in a pensive yet heroic pose on an eerie suburban street. If it seems a little blown out of proportion, the music on You're Not Alone will cure you of that notion. The sprawling, 16-song album is a cornucopia of spirit-lifting, even occasionally reflective party jams every inch as valiant as its cover. Naturally, the first word uttered on You're Not Alone is "party." It's chanted robotically throughout the album's opening track "The Power of Partying," a palate-cleansing burst of symphonic euphoria reminiscent of Europe's "The Final Countdown." No, really. From there, the galloping, synth-spiked hard rock of "Music Is Worth Living For" imagines a team-up between "Jump"-era Van Halen and "Howling at the Moon"-era Ramones. From there, the intensity doesn't let up. "The Feeling of Being Alive" is a spoken-word interlude that encourages the listener to embrace rather than suppress their feelings of inadequacy or unease; it's delivered in such earnestness, there's no question of ironic intent. The one-two wallop of "Party Mindset" and "The Party Never Dies" hits up power balladry and anthemic abandon with equal aplomb, while "Keep On Going" is like Queen karaoke, all stadium-sized sing-alongs and adrenalized riffs. One of W.K. 's greatest tricks is how well he cloaks great songwriting beneath his larger-than-life presence. "The Devil's On Your Side" is an infectious, bombastic exercise in classic-rock craftsmanship, and it's complemented by "Beyond Oblivion," whose tender, piano-tinkling intro erupts into a monumental, melancholy instrumental. And on "Total Freedom," he forges a polished dynamism, veering from soft, melodic passages to cosmic bliss. You're Not Alone isn't a far cry from W.K. 's past output, going all the way back to his breakthrough debut, I Get Wet, in 2001. That album was released in the wake of 9/11, when the world desperately needed a bracing injection of positivity. The same can be said today, and on You're Not Alone's self-titled closing track, he sounds like a motivational-speaking Meatloaf as he sings, "Make your dreams your destiny / And do what must be done / If you're frightened, if you're worried / You're not alone." Andrew W.K. often gets dismissed as a one-dimensional party animal, and that's understandable. That is, after all, his brand. But contextually speaking, there's something profound and even poignant about his maniacal refusal to let darkness overcome him — or anyone else within earshot of his booming music. "And I bet you never thought you'd live to see the day / Where we could play with joy and laughter," he growls gloriously on "Music Is Worth Living For." It took 12 years, but thanks to You're Not Alone, that day has finally arrived.